weaselsnake: Sometimes it's more fun to deliberately misinterpret vanity license plates. Sometimes it's more fun to deliberately misinterpret vanity license plates. Seen on the highway recently: License plate MYPMKIN. My thought: It's always nice to see a dedicated film lover. 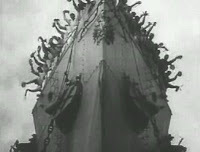 And who could argue with the brilliance of Sergei Eisenstein's 1925 silent classic The Battleship Potemkin?